← Hexagons – Who knew math skills would be handy in card crafting! I loved the heavy craft card base of the September 2013 Paper Pumpkin kit, but the “target” didn’t fit with my idea of a cute card. I thought it would make a great card if I added Stampin’ Up! retired “I Am Me” designer series paper with the cameras. I could use it for a vacation or bon voyage card, congratulations or whenever a picture was involved. That’s all the time right?! I added a Garden Green layer on top of the card base under the camera DSP. I lined it up with the right edge (covers the target) and added a Garden Green layer under the white file tab piece to make it stand out. I stamped the greeting and added the stitched Real Red ribbon. Then I snipped some of the leftover stars from one of my favorite Paper Pumpkin kits (I bought 10 of the refills of the Noel to make Christmas cards – I did say I loved it!) and add that to the top of the file tab. Great festive card for many occasions. Did you know that as a Paper Pumpkin subscriber, you can buy addition Paper Pumpkin full kits (which include the stamps and ink spots) or just the refill kits (without the stamps and ink spots)? Take a look at the other past Paper Pumpkin kits and refills that you can purchase as a Paper Pumpkin subscriber. It’s a great way to create easy and quick cards for very little money and very few supplies. And if you are a new subscriber signing up by September 10, you can get your first 2 months’ kits at 50% off. See my July 23 post with the details and sign up here. Here’s the Noel Paper Pumpkin refill kit, and it’s still available while supplies last! 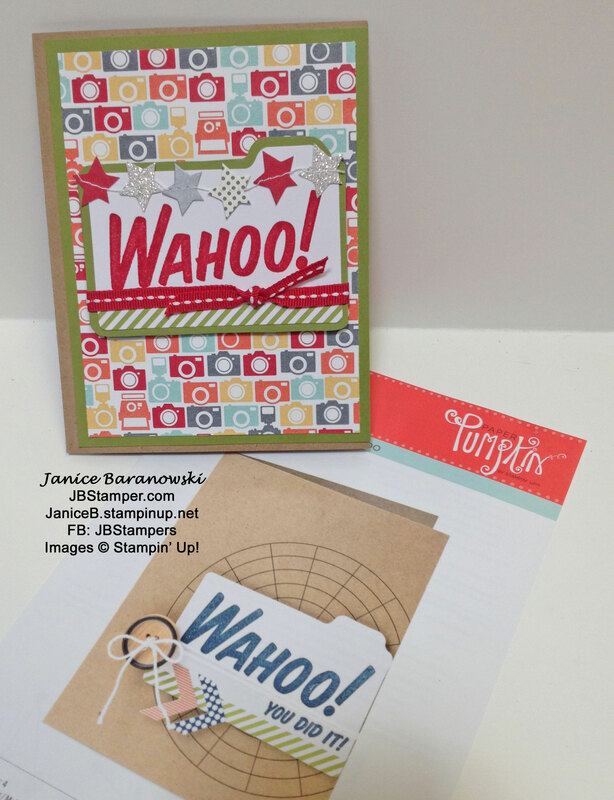 This entry was posted in Congratulations, Paper Pumpkin, Thinking of You cards, Vacation and tagged celebration, congratulations, Paper Pumpkin, Paper pumpkin alternative, Stampin' Up!. Bookmark the permalink.